Words cannot begin to express how AMAZING this pie is. So to honor that this is going to be a blissfully short post. The key to making this pie unforgettable is very simple. All you need are local, freshly picked strawberries, some rhubarb which grows rampant in most areas, and a bit of orange zest to tie it all together! There is no doubt in my mind that this pie would still be good in the dead of winter with store-bought produce but it would definitely be the ugly step child in comparison. So much so, that now that I have had the real deal I would NEVER be able to make it otherwise. And because I hate depriving myself of anything this good, I’ve decided I will just have to pick enough berries this season that I can freeze a bunch and make this pie year round!!! If you are local to the Milwaukee area and want to go pick I highly recommend going to Barthel Fruit Farm. They are located near Mequon, WI and are hands down the best farm in the area!! In addition to strawberries, they also offer a variety of plants and herbs to buy, sugar snap peas which are available now, and apples and pumpkins coming in fall!! Rhubarb is naturally a bit bitter to taste so the sweetness of these strawberries balances out that flavor profile with ease. And because these berries are SO sweet you can literally cut the sugar down by at least half without even blinking an eye, which appeals to the healthy side of my brain! The orange zest I added to the filling gives you just a hint of that citrus tang through the sweetness of the berries. 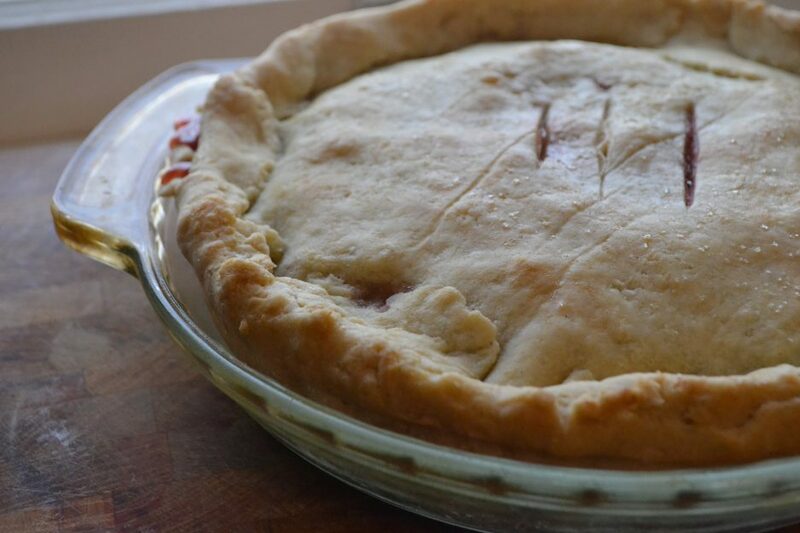 It definitely gives your taste buds a little zing and gives the pie a more elegant finish. The only other advice I can offer is to make two pies, because one is definitely not enough!! P.S. AS always, if you do not need to be GF feel free to just sub in your eveyday all purpose flour!!!! Preheat oven to 425. Prepare the pie crust by following the link above! Mix rhubarb, strawberries, sugar, orange peel, flour and nutmeg in a large bowl. Turn into prepared pie shell. Cut the butter into small pieces and dot the filling with them. Place the second pie crust over the filling. Cut 3 slits in the center to allow for ventilation. Seal and crimp the edges. Brush with milk or egg whites and sprinkle with sugar. Cover the pie’s edge with 2-3 inch of aluminum foil to prevent the edges from burning. Remove for the last 15 minutes of baking. Bake for 40-50 minutes or until crust is a golden brown.